2. For the filling: Combine the water, sugar, cornstarch and salt in a large saucepan over med heat and bring to a simmer while whisking constantly. When the mixture starts to turn translucent, whisk in the egg yolks, 2 at a time (crack them all into a glass measuring cup so you can just pour them in easily). Whisk in the lemon zest, then the lemon juice, and finally the butter. Return the mixture to a full simmer, then remove the pan from the heat. Lay a sheet of plastic wrap flush to the surface of the filling to keep it hot, and stop a film from developing. 3. For the meringue: bring the water and cornstarch to a simmer in a small saucepan over medium-high heat, whisking frequently. When the mixture turns translucent and begins to bubble, remove from the heat. 4. Whip the egg whites and vanilla in a large bowl on low speed until froathy. Mix the sugar and cream of tartar together, then add it to the egg whites, 1 tbl at a time. Increase the speed to medium and whip the egg whites until soft peaks form. Add the cooked cornstarch mixture to the whipped egg whites, 1 tbl at a time, and continue to whip the egg whites until they are glossy and form stiff peaks. 5. Remove the plastic from the lemon curd. Pour the hot filling into a baked, cooled pie crust, then spread the meringue over the top. 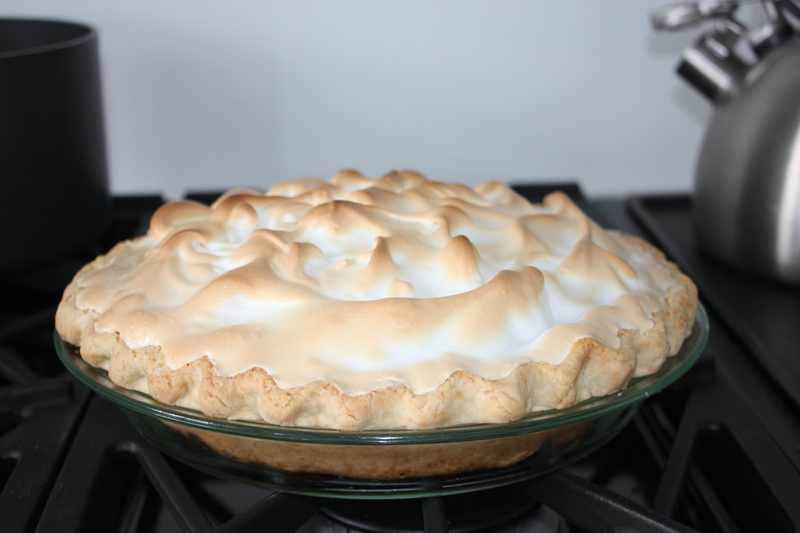 Make sure the meringue touches the crust all the way around the edges to stop it from shrinking at it cools. Use the back of a spoon to make cute peaks, then bake it for 15 or 20 minutes until the meringue is golden brown. 1. Put the flour, salt and sugar in a food processor and pulse a couple of times to mix it up. Top with the butter (cut into tbsp size pieces) and shortening (cut into thirds), and pulse 8 to 12 times, until the butter is the size of peas. 2. With the machine running (I keep my finger on the pulse button), gradually pour the ice water (not the ice though) down the feed tube, and pulse until the dough begins to form a ball. 3. Dump out onto a floured board, split in have and roll into a ball, then flatten into a disk. Wrap each disk in plastic wrap and refrigerate for 30 minutes. 2. Roll out one of your disks of dough (per pie) to an 11″ or 12″ circle. Roll up around your rolling pin, then unroll over your pie plate. Trim the dough so that you have a ½” overhang. Fold the overhang under the edge of the crust, then crimp the edge. Poke all over with a fork, cover with foil, and place in the freezer for 10 minutes. 3. Fill the pie crust (leaving the foil in place) with pie weights or dry beans (you can reuse the beans over and over again, but don’t cook to eat). 4. Bake for 15 minutes, then remove the foil and weights / beans and continue baking for another 10 minutes until golden in colour. 5. Let cool on a wire rack for future use.